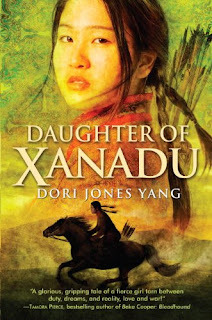 Summary: Athletic and strong willed, Princess Emmajin's determined to do what no woman has done before: become a warrior in the army of her grandfather, the Great Khan Khubilai. In the Mongol world the only way to achieve respect is to show bravery and win glory on the battlefield. The last thing she wants is the distraction of the foreigner Marco Polo, who challenges her beliefs in the gardens of Xanadu. Marco has no skills in the "manly arts" of the Mongols: horse racing, archery, and wrestling. Still, he charms the Khan with his wit and story-telling. Emmajin sees a different Marco as they travel across 13th-century China, hunting 'dragons' and fighting elephant-back warriors. Now she faces a different battle as she struggles with her attraction towards Marco and her incredible goal of winning fame as a soldier. I'd love to read this story. Thank you so much for the giveaway. oh I heard great things about this one. This sounds great, I would LOVE to read this! Thanks! Thanks for the giveaway! I love historical fiction! ohh I have been waiting on this read. Count me in. And thanks for all the great giveaways! Historical fiction is cool, and I've not seen many books that highlight this particular culture before. This sounds neat. Love historical fiction books like this one! Count me in please! I could definitely use this for a reading challenge. I LOVE Asian historical fiction! I would really love to win this one. Please count me in!! Historical fiction is my favourite genre so I would love to win this! I haven't read anything in this line since Mulan quite a long time ago so I would really like to get my hands on it.